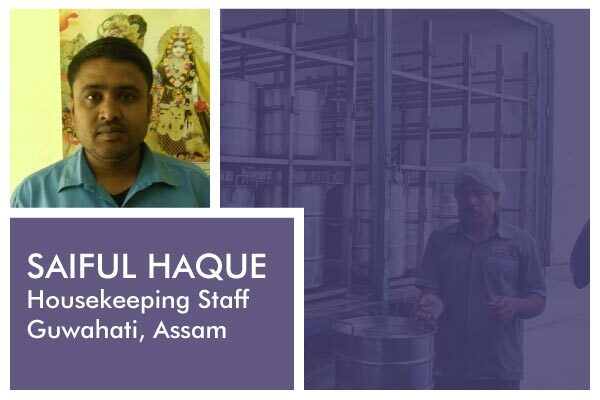 Meet some of our passionate members from Guwahati kitchen in Assam for whom the only aim is to benefit more and more children with freshly cooked, nutritious, and hygienic meals on every school day. Since when have you been working in Akshaya Patra? 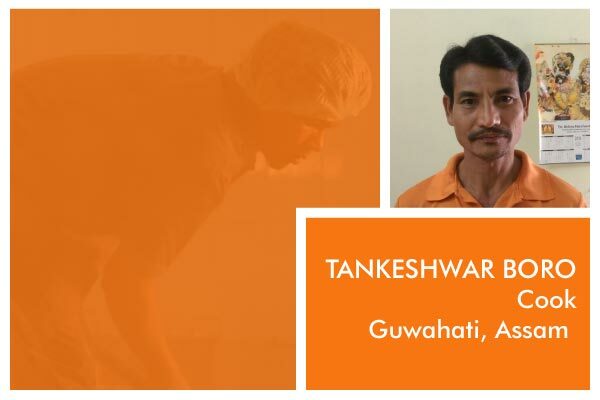 I have been working in Akshaya Patra since the establishment of its kitchen in Guwahati in January 2010. Why did you choose to join Akshaya Patra? I was looking for a job and came across the opportunity to work with Akshaya Patra. During the interview, I was initiated to the Foundation’s cause which inspired me to join the organisation. What was life like before you joined Akshaya Patra? Prior to joining Akshaya Patra, I was living in a miserable condition as I was unable to provide for my family due to financial constraints. Describe your typical day as a cook? As a cook, my day begins at 3:45 a.m. After completing all the mandatory procedures in the hygiene chart and putting on my protective gears, I begin the cooking process at around 4:45 a.m. and that continues till 8 a.m. After the entire cooking process is over, along with other cooks I take a break for half an hour and then resume work to clean up the cooking area. What is the most important thing you consider while preparing meals in such large quantity? I consider cleanliness and hygiene of the cooking area as the most important thing while preparing meals. It has been a very nice experience. My days end with a sense of satisfaction that I am cooking meals for children who are the future of our country. What makes working with Akshaya Patra special? Personally, Akshaya Patra has a very special place in my life. And, since the Foundation is working towards benefitting and bettering the society, it makes working with Akshaya Patra all the more special. I have been working in Akshaya Patra since August 2010. I was in need of a job as I am the breadwinner for my family. I came across Akshaya Patra’s offer and realised that while providing for my family I will also be working for the betterment of children. This motivated me to join Akshaya Patra. I belong to a very poor family and my income was very low too. This made it difficult to take care of my family. Describe your typical day as a housekeeping staff? As a housekeeping staff, I am responsible for the cleanliness of the entire kitchen. I ensure that the entire kitchen premise is clean inclusive of the indoor and outdoor area of the kitchen. Why do you feel maintaining cleanliness is very important in the kitchen? I feel maintaining cleanliness in the kitchen is a very important aspect especially when we are preparing meals for thousands of children. Hygiene and cleanliness is a crucial factor for the health and well-being of everyone who is consuming the food prepared in our kitchen. My life has changed for the better after joining Akshaya Patra. My financial condition has improved and I am able to provide for my family in a much better way. I want to achieve more in life by continuing to work hard and sincerely with Akshaya Patra. What motivates you to continue working for Akshaya Patra? Akshaya Patra’s social cause of nourishing children with nutritious food and its systematic and effective approach to eliminating hunger motivates me to work with Akshaya Patra. Well, behind every great show, there are behind-the-scenes contributors. And, at Akshaya Patra, those contributors are our very own kitchen staff. Watch out this space to meet our passionate members from Gujarat! We would love to hear from you, so please use the below comment section to share your thoughts and feedbacks. Thank you Rajitha. You can follow up this space as we are going to introduce more of our passionate members from other location who work behind.